One common condition we don’t usually think about when we assess our risk of cardiovascular disease is restless leg syndrome. This may be an oversight since it turns out that there is indeed an association between restless leg syndrome and heart disease. Restless leg syndrome is a fairly common condition that affects people when they are trying to rest. People who have this condition experience a sort of discomfort in the legs when they are falling asleep, that compels them to move their legs around incessantly in order to seek relief. These symptoms are generally not present during the day but occur in the evenings during periods of inactivity, just before falling asleep, or even during sleep. People with restless leg syndrome typically describe one or more of several sensations that compel them to move their legs. These feelings include burning, twitching, creeping, restlessness, pulling or tension in their legs. Sometimes actual leg pain is involved. People with this condition usually describe the discomforting sensations as coming from deep within the legs rather than on the surface and usually occurring around the knees or in the lower legs. These symptoms almost always appear only during quiet rest, and tend to be minimized if the rest is not completely “quiet.” In particular, most people with this condition find that symptoms do not appear while they are performing activities that require them to concentrate on something—for instance, while working crossword puzzles, playing poker, or being emotionally engaged with a spouse or partner. The symptoms of restless leg syndrome are generally relieved at least temporarily by getting up and moving around, or stretching or massaging the legs. Of course, by the time the victim gets up to perform these relieving activities, he or she may be wide awake and must begin the process of falling asleep all over again. 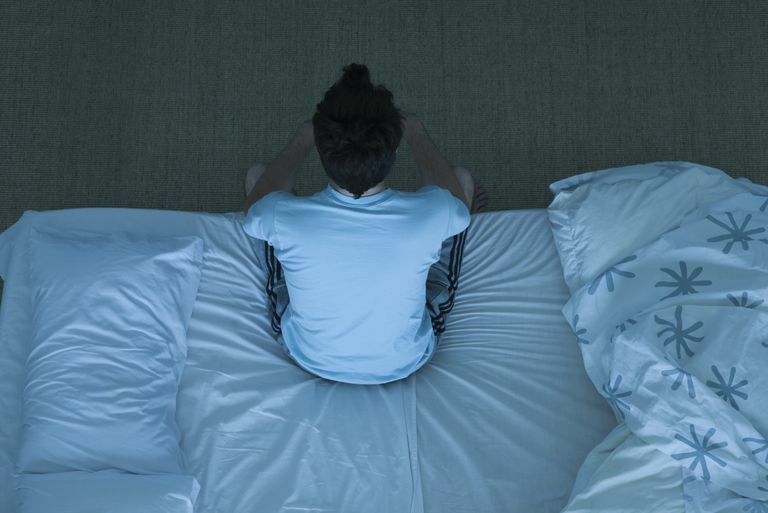 As a result, people with frequent restless leg syndrome may become sleep deprived. Restless leg syndrome is really quite common and occurs to one degree or another in up to 15% of Caucasian adults. It appears to be less common in other ​ethnic groups. While restless leg syndrome can be caused by iron deficiency, kidney failure, pregnancy, spinal disease, and neurological disorders, in the large majority of sufferers no particular underlying cause can be identified. In most cases, restless leg syndrome is a relatively mild and only intermittent condition, which can usually be treated by avoiding caffeine, getting regular exercise, engaging in cognitive activities during quiet periods in the evening, or getting up and taking a short walk on the occasions when symptoms occur. If a specific underlying cause can be found it should be treated. Restless leg syndrome due to iron deficiency, for instance, is particularly amenable to treatment. If the symptoms of restless leg syndrome are more severe and are not relieved by such lifestyle measures, drug therapy can be quite effective. Drugs that have been used successfully for restless leg syndrome include the dopamine agonists, which are commonly used to treat Parkinson’s disease, such as pramipexole (Mirapex). In addition, certain drugs used for seizure disorders have been effective, including gabapentin (Neurontin). Benzodiazepines, which are anti-anxiety drugs, have also been used successfully. Drug therapy for restless leg syndrome may be particularly useful in people who are suffering from sleep deprivation because of this condition. Restless leg syndrome has been associated with an increased risk of cardiovascular disease, but no cause-and-effect relationship has been demonstrated. Researchers believe that if there is a cause-and-effect relationship, it may have to do with hypertension. It turns out that many people with restless leg syndrome also have a movement disorder called “periodic limb movements of sleep (PLMS),” in which repeated episodes of stereotypical leg movements occur while sleeping. Most people with PLMS are unaware they have such a condition (though their sleeping partners may well be). Research shows that patients with PLMS can have significant elevations in their blood pressure during episodes of leg movement while sleeping. The degree of nocturnal hypertension that has been demonstrated is believed to be sufficient to significantly increase an individual's risk of developing cardiovascular disease—and may help to explain the association between restless leg syndrome and cardiovascular disease. Ohayon MM, O'Hara R, Vitiello MV. Epidemiology of restless legs syndrome: a synthesis of the literature. Sleep Med Rev 2012; 16:283. Pennestri MH, Montplaisir J, Colombo R, Lavigne G, Lanfranchi PA. Nocturnal blood pressure changes in patients with restless legs syndrome. Neurology 2007; 68:1213-1218.